RIBCHESTER, an ancient small town, a township, and a parish, in Preston district, Lancashire. The town stands on the river Ribble, 3¼ miles N W of a station of its own name on the Blackburn and Clitheroe railway, and 5½ N N W of Blackburn; occupies the site of the Roman station Coccium or Rigodunum; was reached, in ancient times, by the tide coming up the Ribble; has yielded multitudes of ancient relics, including Roman altars, columns, statues, marbles, coins, and armour, besides anchors and part of a vessel's hull; carries on hand-loom weaving; and has a post-office under Preston, and fairs on 16 March, 16 April, the Monday before Holy Thursday and 5 Nov. The township comprises 2,093 acres. Real property, £3,459; of which £89 are inquarries. Pop. in 1851, 1,650; in 1861, 1,357. Houses, 261. The decrease of pop. arose from the removal of hand-loom weavers to towns. The manor belongs to J.and J. Fenton, Esqs. A workhouse of Preston districtis here; and, at the census of 1861, had 113 inmates. The parish contains also the townships of Hothersall, Dutton, Alston, and Dilworth. Acres, 8,150. Pop., 3,885. Houses, 751. The property is much subdivided. Cotton-spinning and varions manufactures are carried on at Longridge and Knowl-Green. The living is a vicarage, united with the p. curacy of Stidd, in the diocese of Manchester. Value, £175. * Patron, the Bishop of Manchester. The church is ancient but good; consists of nave, aisles, chancel, and chapel, with a tower; and once had two chantries. The vicarage of Longridge is a separate benefice. There are an Independent chapel at Knowl-Green, places of worship at Longridge, an endowed school with £20 a year, and charities £52. Local studies information is held at Clitheroe library. Details about the census records, and indexes for Ribchester. You can also perform a more selective search for churches in the Ribchester area or see them printed on a map. Ask for a calculation of the distance from Ribchester to another place. "RIBCHESTER, a parish in the hundreds of Amounderness and Blackburn, county Lancaster, 7 miles N.W. of Blackburn, its post town, and 4 from the Longridge station on the Fleetwood, Preston, and West Riding Junction line of railway. It is situated on the river Ribble, and comprises the townships of Dilworth, Dutton, Alston, Hatherall, Longridge, and part of Whalley. Ribchester is of ancient date, being the site of the Roman station Coccium or Rigodunum, where the 20th legion was stationed, and ranked as one of their first cities in Britain. At this place the tide formerly encroached. Many coins, statues, altars, columns of temples, inscriptions, and other antiquities have been found at various times. A portion of the inhabitants are engaged in the cotton mills, and others in the neighbouring quarries of slate and iron. The living is a vicarage with the perpetual curacy of Stidd annexed, in the diocese of Manchester, value £175, in the patronage of the bishop. The church, dedicated to St. Wilfrid, is an ancient stone structure with a square tower containing six bells. It has been enlarged at some distant period. There is also a district church at Longridge, the living of which is a perpetual curacy, value £170. The parochial charities produce about £74 per annum, of which £20 goes to the support of the free school, founded by J. Dewhurst in 1771. There is a parochial school for both sexes, also a Sunday-school. John and James Fenton, Esqs., are lords of the manor." "STEDE, a chapelry in the parish of Ribchester, county Lancaster, 6 miles N.W. of Blackburn. It is situated in the valley of the Ribble, and has the ruins of a disused Norman chapel." In 1835 the parish of Ribchester contained the townships of Ribchester Alston, Hothersall, and Dutton. You can see the administrative areas in which Ribchester has been placed at times in the past. Select one to see a link to a map of that particular area. Some notes on the history of Ribchester prepared by Peter Shearan in connection with his researches into the Hesmondhalgh family. View maps of Ribchester and places within its boundaries. 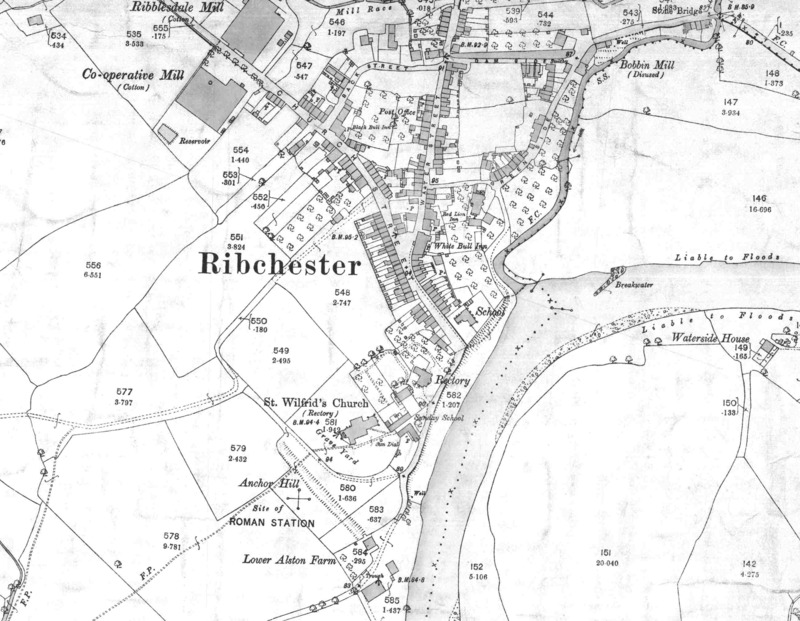 A map of Ribchester around 1890. The Workhouse site has an interesting description of Ribchester workhouse. 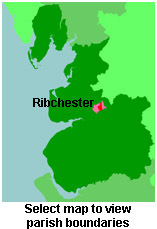 For probate purposes prior to 1858, Ribchester was in the Archdeaconry of Richmond, in the Diocese of Chester. The original Lancashire wills for the Archdeaconry of Richmond are held at the Lancashire Record Office.